I started the painting Medicine Baby in May of 2001 after a Shamanic journey with a South American plant mixture called Ayahuasca. This is a combination of medicinal plants that grow in the Amazon jungle that is said by the ancients to be a gift from the people of the stars. Shamans have used this medicine for thousands of years to invoke and open their spiritual vision. It was the first time I had ever experienced this tea and excitedly expected a euphoric awakening of my consciousness. Instead I was taken deep into my shadow side. I first saw a vision of an Angel glowing with golden light, she/he suggested I make my intention to “know myself.” I set my intention and lay down to spend the day going deep inside. All throughout the journey it felt as though there were spirits rolling my head from side to side showing me my “muck of stuck yuck.” My vision became a panoramic view of my life, showing how trauma and the conditioning of my mind has constricted my spirit, my life, my joy. I could see my fears and how they’ve controlled me. I saw the childhood patterns of how so very, very hard I try to do everything right and how that stress has completely hindered my freedom. As the journey ended I was brought back into present time and I looked around at the others in the group who all expressed a state of bliss. I greeted the sunset trying to be optimistic, “still trying to do it right,” yet I couldn’t ignore my disappointment of going from the vision of the angel and expectations, to dwelling in the shadowed corners of my mind. My journey was over and I hadn’t received what I had been expecting. Yes, I did receive great revelations of awareness into the nature of my fears, self-doubts, and judgments. But my ego was hoping for something of grandeur and brilliance to be shown to me. I wanted to remember who I really was as a spiritual being. I wanted to see my Higher Self, maybe some golden light. The last thing I expected was brown muck of stuck yuck! The journey took place on the ancient ceremonial land in the Mountains of Malibu, California where I lived. As I walked around the land I appreciated the beauty and power of this place I was so blessed to live on. Yet my ego was still feeling very disenchanted with my journey. Then I heard a voice that suggested I start a painting. I don’t ever need my arm twisted to paint, so I headed for my studio to get started. In preparation and ceremony, I bowed in reverence to the Goddess through a Nefertiti bust and she bowed back twice with her eyes. My energies heighten in a bit of shock at this point surprised. I was obviously still feeling the effects of the medicine. I prayed and burned sacred essences to clear the area and call in energies of Light to assist me, as I do in my ceremonial practices. I especially used the sound vibrations of my didgeridoo. I started by using the colors of white, yellow, and bronze, on the base of the canvas. These colors were my kindest take from my journey. A few people came walking over to my studio, one girl’s three-year-old son joined us too and soon we were all painting in the creative flow. It is here that the healing colors came in as I added some turquoise at the suggestion of Gabriel, a three year old angel boy. Again the voice spoke to me and said, “Your journey will not be over until the painting is complete.” I remember thinking, a bit sarcastic, well this better be a masterpiece to make that journey worthwhile. As days past others who journeyed with me visited my studio the painting was looking beautiful and very abstract in content and drew a similar comment from everyone, “that’s what I saw in my journey!” I replied, “Well maybe I’m painting all of your journey’s because this is not what I saw in mine. I did mention that I was told about my journey not being over until the painting was complete. Some, commented that it was already looking finished to them. But I knew I was not done. 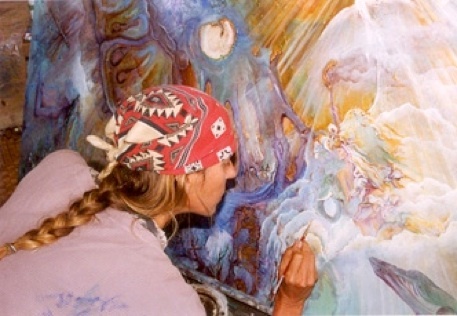 I finished the painting in November of 2001 and felt a huge new shift coming into my life. The hidden awareness I had been given from my journey was now evolving onto the canvas and coming from within. Had I not listened to my intuition, I never would have experienced the mystical magic that painting Medicine Baby brought to me. I’ve never experience such a state of bliss in creating a piece of art. So many spiritual epiphanies revealed themselves to me throughout the process of painting this piece. Stirred like never before inside… My heart expanded wide-open. The brightest sparkles of light saturated my vision when I close my eyes, but I can’t seem to words or a phrase that could honor or do justice to this experience. I understood the Love of Oneness in Creation that ancient spiritual text speak to. I could feel how insignificant and petty all my human feelings of self-pity and jealousies were. I wanted to run and tell everyone especially since this was just after September 11th, I wanted to lighten their hearts, but once I tried to put it into words the power of the epiphany was not there. I understood then that everyone must feel this experience for them selves. I know that it is truth and although the experience of bliss accompanied the moment of discovery and left thereafter, I can call upon this awakening and know if One can feel it, than others will as well and this is the medicine of the painting. The Eagle delivers higher vision and the Seahorse symbolizes the male participation in the birthing process. In the sky is a spirit buffalo hunt, which brings abundance back to the awakened people of Earth. At the bottom right you see the back of the medicine woman who dreams the image into reality. It is me, bring life to Medicine Baby. All have come together to heal the relationship between the human tribes on Earth. At the bottom right you see the back of the Medicine woman who dreams the image into reality. It is me with hawk guardians, bring life to Medicine Baby. All have come together to heal the relationship between the human tribes on Earth. That the Earth and Her children will remember they belong. There was a fall… we forgot the All. I’m afraid she is dying. Medicine Baby Bless the land. We must all take a stand. The Earth Goddess is of the Black African race. She grounds her energies with a tree as she sends her rhythmic heartbeat soul into the center of Creation. When asked what the most important thing we can do for the healing of our planet, Thich Nhat Hanh replied, “The most important thing is to hear within ourselves the sound of the Earth crying.” Hear Her cries inside of you, share these feelings and bring them into an honorable consciousness, your deep internal connection with the Earth. This is a time to plant new seeds in soil that is humble, as well as cultivate those already planted. Seek the feeling that is you as the “Earth Goddess,” feeling Her in your hands and feet and behind your eyes seeing through you, as you. Bathe in the power of grandmother moon laying on the green grasses of Her body, feel Her breathe you, connect and trust in the feminine, your Mother connection. 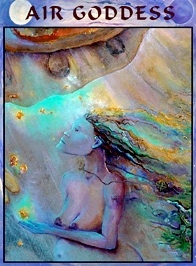 The Goddess who symbolizes Water is the inspiration of the cycles that supports all of life. In every drop of water dwells the Goddess. In the painting Medicine Baby, She is Asian of the Yellow race, a Mermaid swimming towards the center with the sea turtle and dolphins to bring their medicine into Creation. Water an essential element to life, like crystal holds memory and is perhaps the most effective carrier of vibrations. Water is a magical, blessed essential foundation for all life. We must once again learn to relate honorably to all life forms and Elements, as sacred. In humble gratitude, with hearts full of sacredness, the mermaid, dolphins and whales sing the Waters and the Planet into health and humanity into new ways of being. The Fire Goddess in Medicine Baby embodies the White race as the Nordic Goddess of power and vision. Throughout history sacred fire has played many roles in life. The Goddess stands in the East where the sun rises, bringing in new beginnings. 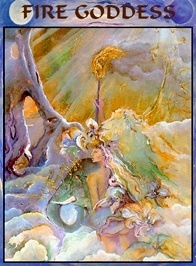 She sends her powers of the Sun into the center of creation for the new Earth. She holds the fires flaming pillar of passion while riding with the elephant of wisdom and the lion of courage. She is a warrioress and protectress, a healer, and a guardian of children, it is through her spark of inspiration and creativity all dreams are born. The Goddess of Air is of the Red race, a Native American who breathes golden magic spinning in the Air of possibilities for our new Creation. Standing naked in the wind of intuition, pregnant with new possibilities, we breathe and birth new ideas. Air Goddess calls on her spirit messenger the dragonfly to re-mind us of the golden blessings in breaking free of illusions. Her purpose is to hold the sky and the cosmos in balance with the earth. Her medicine is of the wind and Air. She is sending golden magic to assist the Medicine Baby in fulfilling his Great Spirit mission. All races are working together for the good of the whole. The eagle delivers higher vision and the medicine of responsibility and power in becoming much more than we appear to be now. The medicine of the Seahorse is bringing in a new model of male identity, “the cooperative male.” In the sky is a spirit buffalo hunt, which brings abundance back to the awakened people of Earth. The Medicine Baby in the center represents the child, soft in his innocence of the male, which is needed for recognizing the feminine in her wisdom and healing the Earth. This unity brings peace back to Creation on Earth. He is decorated with crown jewels that ordain him as the chosen one. This child united with the feminine energies, sends golden Heart energy into the center of the new Earth. His aura manifests as butterfly wings, which are aligned with the rainbow colors of the Chakra. There is probably no other insect or animal that denotes the process of transformation and shape shifting more than the butterfly. He teaches us that growth and change do not need to be traumatic and he assists our spiritual ability to transform any energy back into Love. At the bottom right you will see the back of the Medicine woman who dreams the dream in her imagination and manifests it into creation. It is I, watched over by hawk and falcon guardians. The Humpback Whale brings in ancient knowledge, the record keepers on Earth coming in to assist in the Co- Creation. Many beings are experiencing a call to move into their authentic identity and creativity. Merging our talents, skills and experiences with deep inner knowing of a much bigger picture. In our connection to a larger universe, us as the Co-Creator using our skills with our feminine/masculine in balance, we become the way-shower for a world that works for everyone. We have critical problems in America today and humanity faces enormous challenges for the survival of our species. A sacred understanding of all life is needed, our collective dedication and intent for love and healing to serve and support life is needed. Look for the leader within your self; following anyone into cynicism or anger will only lead us away from healing. Medicine Baby has come to remind us of spiritual law and to help heal the relationship between the tribes of human souls and hearts in this world.